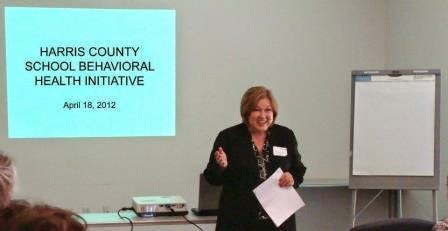 Susan is the President and CEO of Mental Health America of Greater Houston. Susan grew up in the Midwest and graduated from South Dakota with a degree in psychology. She resided in Los Angeles and Chicago before moving to Houston twenty years ago. She worked in development at MD Anderson Cancer Center and Rice University before joining Mental Health America, this area’s oldest mental health education and advocacy organization. She works to change attitudes about mental health and mental illness and advocates for good public policy and access to the effective treatments that are available for mental disorders. Susan is married to Jim and has three daughters, a stepdaughter and a stepson. She is the grandmother to ten grandchildren. I was born and raised in South Dakota and have lived in several Midwestern states. After the end of a 14-year marriage, I changed my life in earnest and moved to Los Angeles. The next stop was Chicago. The opportunity to relocate to Texas came a few years later. We heard the weather in Houston was “tropical” which suited us just fine. Most of my career had been in hospital development and fundraising, working with regional medical centers and medical schools. My first employer in Houston was MD Anderson Cancer Center. I will always be grateful for that experience, they are only the best in the world. In the mid-1990s, I joined the development staff at Rice University and continued to travel nationally. Assigned to bio-sciences, bio-engineering and nano-technology, I had the unique opportunity to know and work with Professor Rick Smalley following the awarding of the Nobel Prize. When I once again decided to make a major change in my life, I joined Mental Health America in the late 1990s. I left a development office of more than one hundred staff members to become a shop of one. Like so many of us working in nonprofits, I felt called to support something that was personal and in an area of great need. Sixty years ago, Miss Ima Hogg founded MHA in Greater Houston to be a voice for people who had no voice. It is such an honor to be here and continue this work. I have generations of reasons to care about mental health. 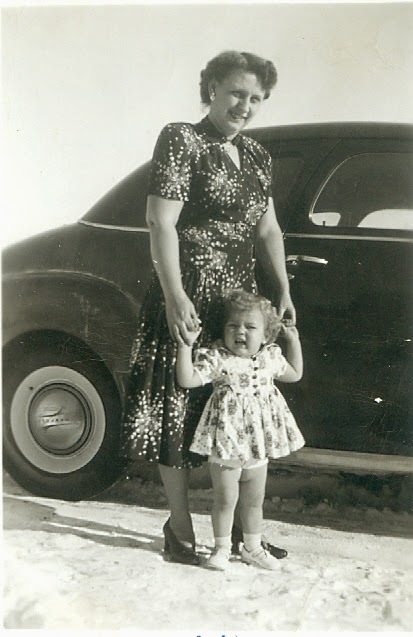 Without going back too many generations, I lost my mother at the age of 59 when she died from complications from alcoholism. In fact, she suffered with major depression. Because of stigma, we never called her illness a mental illness. I used to wonder how people died from alcoholism and, sadly, I found out. I do think that if we had called her illness by its real name and treated it differently, she might have lived to enjoy her grandchildren and see her great grandchildren be born. We all missed so much by her not being here. That's not an uncommon story. It is a story shared by many. I have three beloved daughters. They have six children and each generation has its own stories. How they manage their challenges makes my heart soar. The power and beauty of a family is in the love and support we can provide to one another. By virtue of the work I do, I know and have heard from so many people who have struggles, so many. We know they need understanding, support and proper treatment. Treatment works. Early intervention works. We need better public policy and access to care for everyone in need. It’s not just what we are all called to do as a caring community, it is a benefit to the community. It is more cost effective to help people recover their lives rather than cycle in and out of jail, shelters and emergency rooms. It is really difficult to believe and absolutely impossible to accept that this still happens way too often. The last legislative session was a good one for mental health. There seems to be a realization that you can’t sweep mental health under the rug anymore. We made progress, but there is much more to do. An example of our current work is a school behavioral health initiative, which involves a large number of independent school districts in the area. It can take as long as fourteen years for a diagnosis following the onset of symptoms. Think about the difference in the trajectory of a child’s life, not to mention the reduction in suffering, if we identify kids earlier and they get the help they need. Legislation from the past session will help make that a reality by providing training for teachers and administrators and also by adding training to recognize signs and symptoms of behavioral health problems in educator preparation programs. Remember, there isn't a blood test for these illnesses and there is a lot of denial along the way. These accomplishments were supported by a passionate and effective group of stakeholders, including teachers, counselors and nurses from our independent school districts, parents, grandparents, community organizations that serve children, advocates and others. We need to support educators and make sure they have knowledge, tools and resources. That’s an easy one for me. As a young child, I spent several years living with my grandparents. 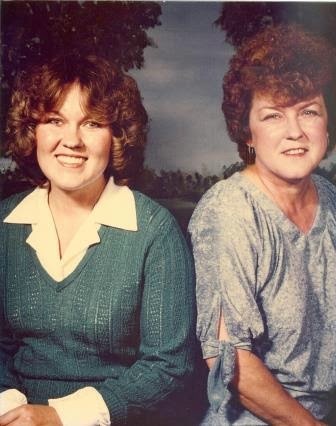 When I was five, my grandmother was in a horrible accident when their car skidded on ice. Other people in the car were killed and my grandmother went through the windshield of the car. She had a traumatic brain injury which left her paralyzed from the neck down and unable to speak. They expected her to die so they let me in to see her to say good-bye. To everyone’s surprise, she survived and lived another seventeen years. However, she lived in constant pain and had limited medical treatment for pain or for recovery. Over the course of those seventeen years, the paralysis gradually improved leaving her paralyzed from the waist up on her right side and able to speak with the vocabulary of a very young child, though this followed many years of no mobility or ability to speak. We lived in a small town in South Dakota, population 400, with one doctor about thirteen miles away. There were no social services, though neighbors did bring food for a while and visit. We had never heard of physical therapy. It’s difficult to recall, let alone describe. In all those years, never once did she ever complain. We knew when her pain was most severe because she would close the drapes and just lie on the sofa with an ice pack on her head. This was a woman who had every reason to withdraw from reality, yet she got up every day and gave that day her best. If I had one grain of her strength and courage, I'd be something special. We did have adventures when I got a little older and she was more mobile. When I was fourteen, we had a Sunday morning ritual of watching the television ministry of Oral Roberts. He healed people and at the end of his show would ask people at home to stand and hold up their right hand and ask to be healed. I helped her with that hand every week. We were so unsophisticated and we were looking for a miracle, so one day we ran away from home to go see Oral Roberts. We waited until I was fourteen and could drive legally with my farm permit. I had eight dollars in my pocket and I didn't read a map, so we stopped at every gas station and asked for directions. Unfortunately we had a little fender-bender and my grandfather was called. He had to come and lead us back home and we were in big trouble! Undaunted, we waited a couple of years and devised a new plan. We had heard of the Mayo Clinic and it was only 250 miles from home. Once again, with less than ten dollars in my pocket but a lot of hope in our hearts, we quietly slipped away. When we went through the doors of the Mayo Clinic with no money and no insurance, they found a home for me to stay in and did a full assessment of my grandmother. They told us about physical therapy, which would have been so much more helpful if done earlier. They referred us to a physical therapist in a town fifty miles away from home, which we thought was just amazing. Of course they had to call my grandfather and we were definitely in trouble again. He told us to get home on our own, which we did just fine. What advice would you give to someone new to working in the mental health field? Never compromise your integrity. Never. And treat others as you wish to be treated, which is just about as solid and simple as it gets. When you have an opportunity to work with colleagues and other organizations, always be a good and generous partner. Together we can have a greater impact so treat those relationships as a sacred trust. Give more than you hope to get and forget about who gets the credit. That is much easier in a good relationship. Not so easy when you get burned, but you can’t let the bad experiences keep you from doing the right thing. Be the good example for others even when it’s hard. I love my job but my family is everything to me. I have three daughters, a stepdaughter and stepson. Plus I'm the grandmother of ten. Six of my grandchildren live here and four in the Midwest. Every weekend gives me balance because nearly every weekend, I have time with my grandchildren. The Houston grandkids range in age from 6 to 18, so our activities are very different. We love going to the theater, musicals, movies, shopping, antiquing, football games, or we may just shoot baskets in the driveway. If I’m really lucky, I will get some time with my busy daughters. I also love dogs and have a few, mostly rescues. My favorite is a big, beautiful white German shepherd named Rikr. He's my shadow and follows me around the house. My dogs make me laugh every day. I came here with all the stereotypes of Texas in my head. I didn't know what to expect and I was just so surprised. Houston has the best of everything! Some of it is so unusual – a house covered in beer cans and an art-car parade, yet we also have the best medical care in the whole world in our backyard. People who have health challenges do their research and this is where they come. I love the people. Like where I come from, there are such wonderful characters. I miss Southern California and there are things about growing in rural America that I miss, but I do love Houston. I am not leaving. I love my backyard. People sometimes ask me where I’m going on vacation and I'll say, “To my backyard.” Also, my husband Jim and I go to Carrabba's every Friday night. With busy lives, it’s the one time when we actually get to catch up and have a real conversation. That it always our time. I enjoy Carrabba’s and I love Pappadeaux’s, but can’t think of favorites without mentioning Paulie’s shortbread cookies. One of the things I enjoy most is when the West Texas peaches appear in Houston. Being a Midwesterner, I've done a lot of canning and preserving in my life, but I have never had such a heavenly smell in my house before. It’s such a treat to be able to give those little jars of jam as gifts and I absolutely love the sound of the lids popping when they seal to the jar. When I moved here twenty years ago, I wondered, where are the trains? We had three different types of trains in Chicago to get you anywhere and everywhere. I’ve now been commuting down 290 for twenty years, so I would love to see some trains or some diamond lanes at least. I will never understand a barricaded HOV lane. Really! You get stuck there behind one of those smoke belching buses and think you’ve found a new hell. The other thing I would change would be the air quality. 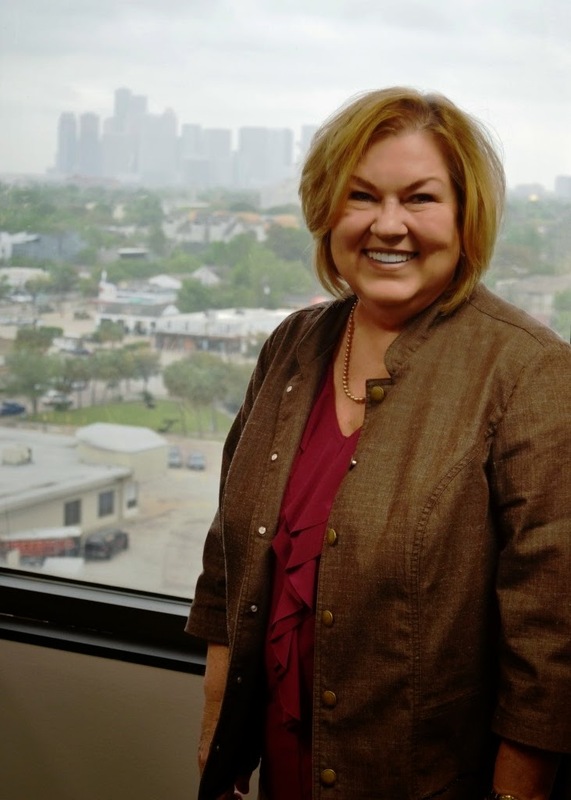 Susan was nominated as an Inspiring Houston Woman by Sarah Fisher. To find out more about the work of Susan and her team at Mental Health America of Greater Houston, visit the MHA website.